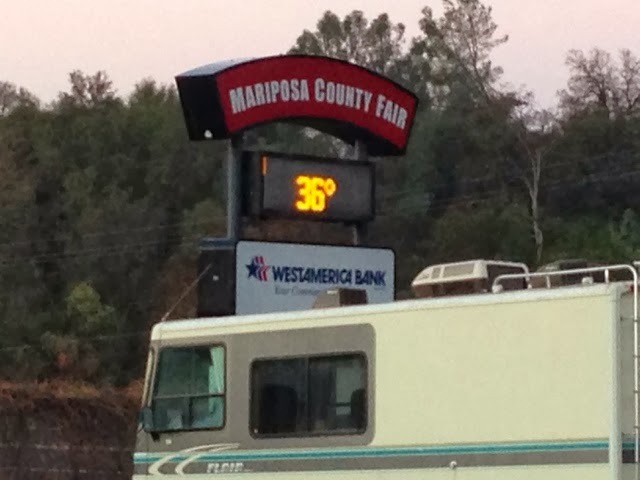 I was on the road early from Mariposa. It was just at the freezing point with frost on the roofs but not in the ground. A bit cold for the shower I took on the ingested building. The sign said 36 degrees. 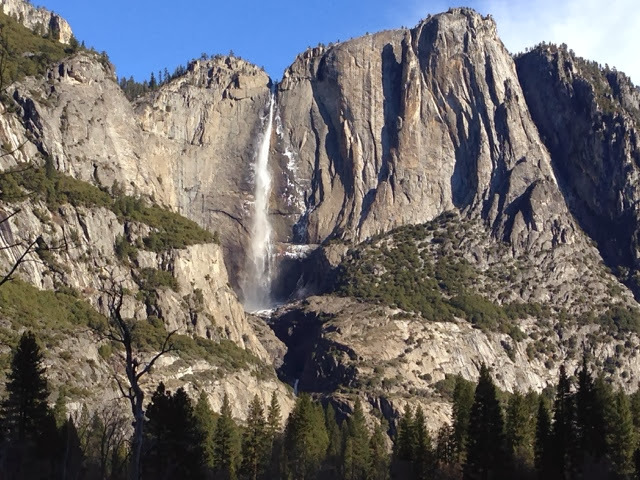 It was 21 degrees in Yosemite overnight. The road to Yosemite twists and turns its way up and down hills on the way up the river. 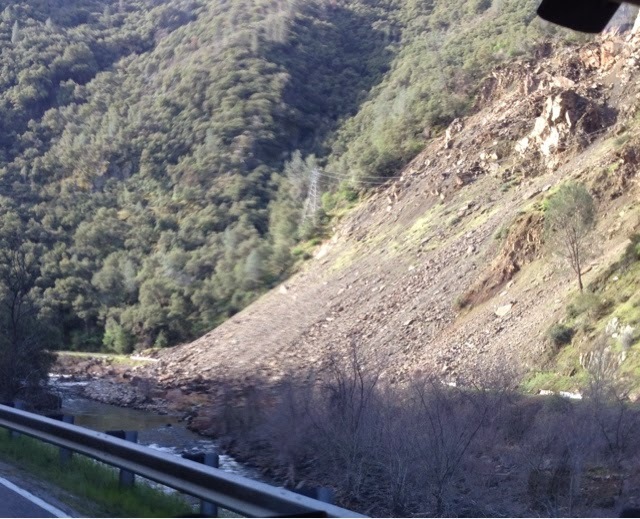 At one point the road is closed due to a landslide and the road was temporally diverted to the other side of the river. Based in the size of the slide I think it will stay this way. The light has us taking turns on the two one lane bridges. This was a huge landslide. You can't even see the road. 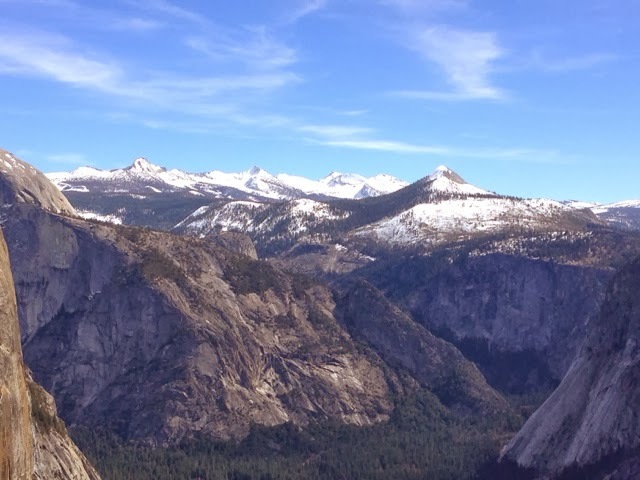 My Senior National Park Pass got me in to Yosemite without a fee. 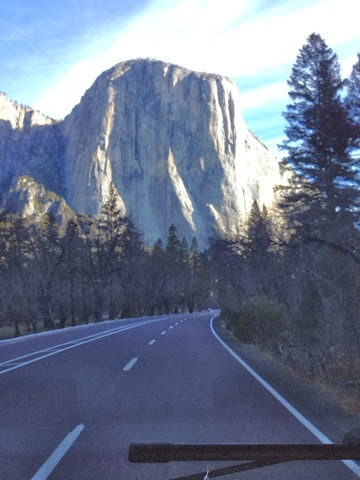 On my way into the park I asked the ranger about my hike selection of hiking the Upper Yosemite Falls trail. She said it was a good trail for a strenuous workout. I told her I was looking for that. The National Park book I had said it was 2 - 3 hours. That will be great and I will be out of the park and will find a new campground before dark. At least that is what I thought. As you enter the gate I went through you encounter this hole you have to drive through. 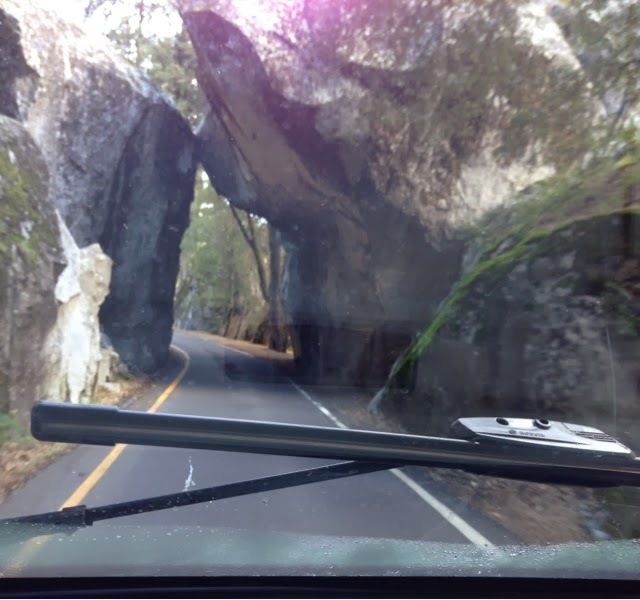 After passing through this rock formation you drive on a large loop road one way east and one way west through the Yosemite Valley. There are vistas and other senery in all directions a real head turner. 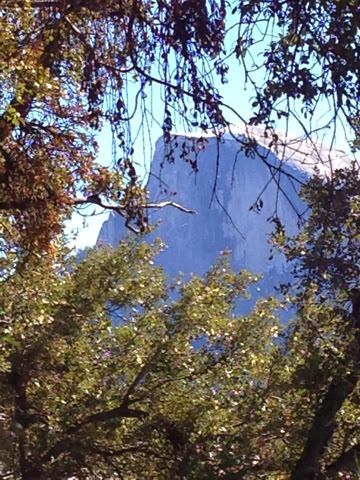 The major attraction is on the left going in and that is the mountain they call El Capitan. 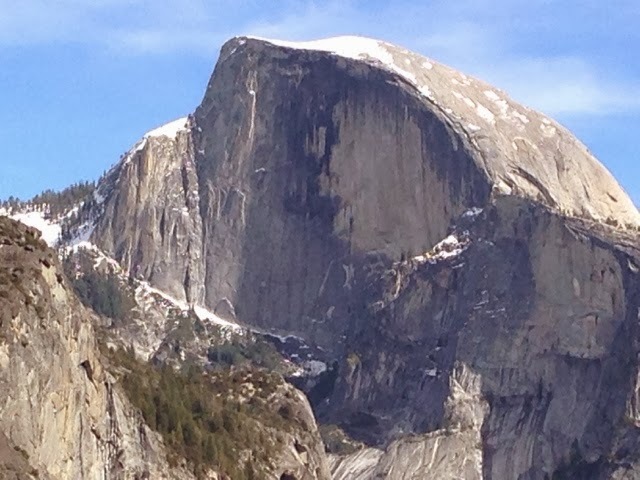 My challenge for today is just beyond El Capitan. 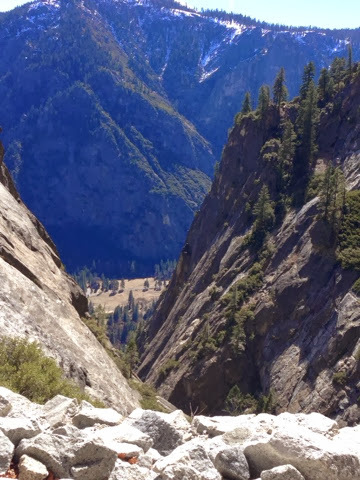 I need to drive the full length of the Valley road to make it across the other side to end up at Yosemite Falls as seen below from afar. 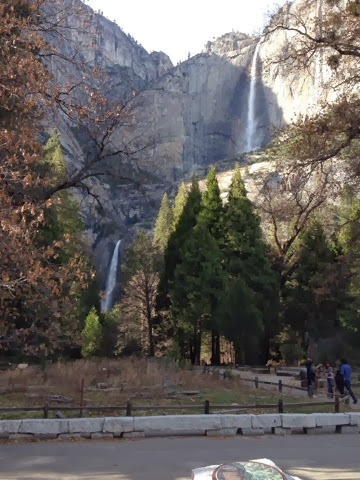 I parked at the lower falls on the designated side of the road parking spot. They don't let you park at the trailhead as it is for tent camping parking. 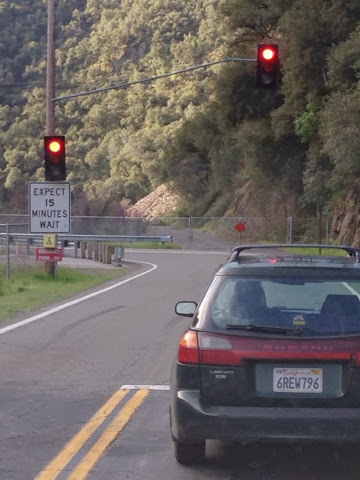 This added about a mile extra to and from the trailhead. The trail starts off climbing about 1000 ft with switchbacks. It is grueling right off the bat. As you are climbing the views just keep getting better. The trail kind of straightens out as it works it's way to the east and then drops as it comes to the falls. 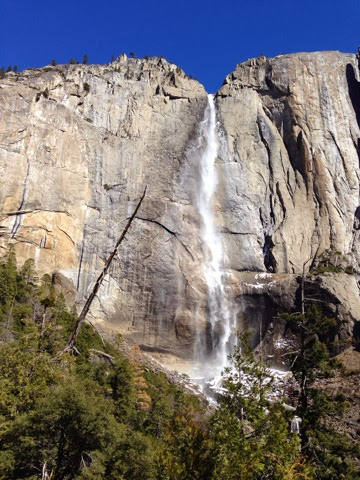 I am at the base of the upper falls and think I have made it and I'm here in 1.5 hours so I am on the 3 hour round trip hike and it has been stressful. Matt a young man from Atlanta came here to hike this again as he did 6 years ago. He busts my bubble and says the trail goes to the top of the falls. Then I knew that the 2 - 3 hour hike in the National Park book meant one way. Oh my. I didn't come here to make it an easy day and I had more that I can put into it, so I continues with Matt to the top. At least for a little while. After the base of the upper falls we were back on climbing switchbacks up the crevis of where the falls rock meets the next mountain on the left. As I went up it got progressively harder to climb. I could feel my chest beating hard and had to stop every few switchbacks. I would pass people only to have pass me as I tested. We were all tied together in a quest to make it to the top. I vowed to meet Matt at the top as I promised. I was not alone in being labored but others seemed no affected by the journey. The vista just kept getting better with each switchback. This view gives you the idea on how we climbed up in the crack between the two mountains. At the top this group of guys were on the edge waiting for their friend to finish up the delay camera setup to join them. I had passed them once on the way up and they told me that after I passed a bobcat came out and took down a squirrel. I would have liked to see that! We had some snow on the ground too but we were south facing so it melts more. Matt moved on to the top of the next mountain and I couldn't as I had nothing more to give. You cross the river that feeds the falls to get there. Matt was camping at the park. After a half hour of rest I started my way down knowing it would be well after 3p when I get down and I still need to drive out of the park and find a campground. 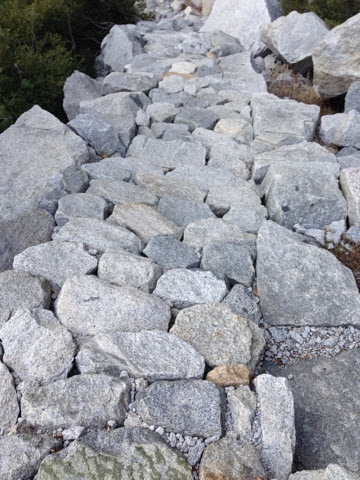 The trail up has some unique rockwork even at high altitudes, like this on near the top. Back to the base of the upper falls the sun had moved and it allowed for an angle to cast a rainbow. Such a beautiful thing of nature. Back down to the camper you can see both falls and the crack to the left that we climbed in the second set of switchbacks. I was then on my way headed south out of the park at 4p before I got to the camper. I was headed out to find a campground and although I could and did it it was a frustrating experience and I was tired and hungry. In reflection, I don't see how anything I post in the future can have the sheer beauty and grandjure that I post now. I can't dream of anything that can come close and anything that can physically challenge me other than hiking the Grand Canyon. 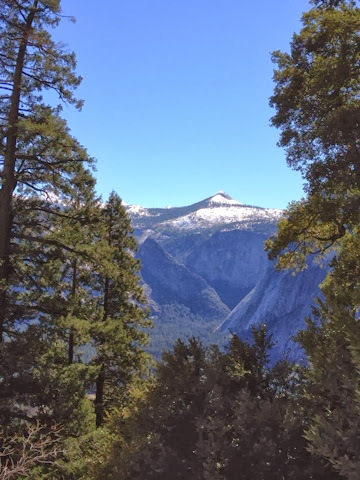 I climbed 2900 ft vertically and 7 miles of trail linearly. I thought I was physically ready but failed to take into account that I was at very high altitude. Starting at 5100 feet and near the top 8000 feet. No wonder I was having a hard time breathing in the thin air. This was a limiting factor for not only me but many others. The other thing is that I needed more than the two leters of water in my camel pack. If I do this again I need to buy a filter to filter spring water on the climb. I needed twice as much water. If I am ever going to climb the grand canion I need to arrive a couple days early to aclamate my body to the 5000 elevation there. 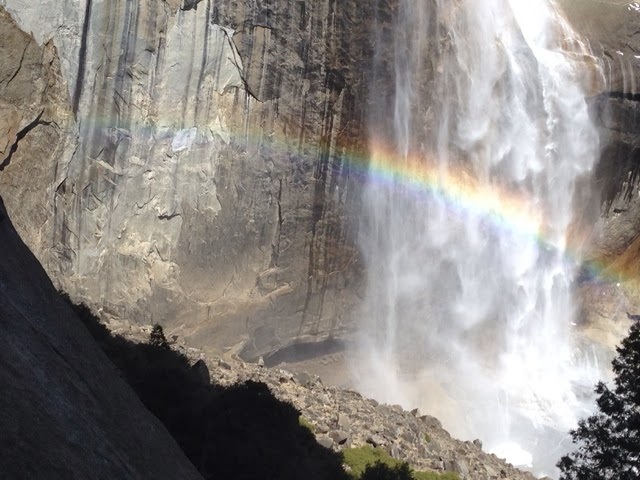 So I looked on a map and I saw that Manina and I hiked up to Vernal Falls on the east side of Yosemite. 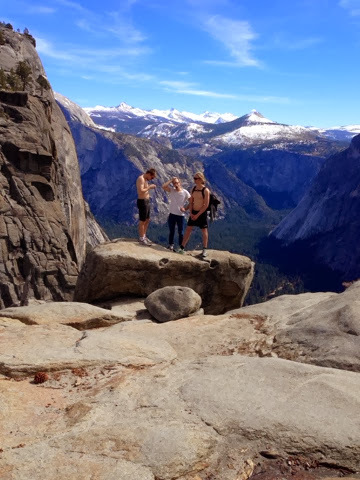 It was a pretty tough hike, but well worth it. 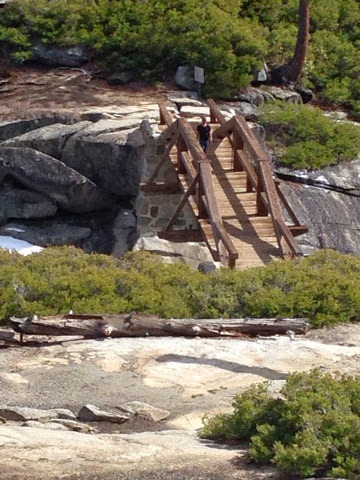 The trail over there continues on to the top of the Half Dome. I'd like to make that very long walk someday, but that will likely require some overnight camping. Great pictures!! !